Bolt Size: 10mm bolt with 5mm threads. Order today and receive free standard shipping on your Shorai LFX24L3-BS12 Lithium-Iron Battery. Only valid in the contiguous 48 states and not valid with any other offer. Shorai's Lithium Iron batteries are the ultimate fusion of light weight and power technologies. The LFX24L3-BS12 battery weighs in at 3.97 pounds and offers 360 CCA. These batteries will require no change to your charging systems and are a drop-in replacement for your original battery (Included shims may be required for installation). What makes Shorai batteries different? They contain Shorai-proprietary eXtreme-Rate Lithium Iron prismatic cells (chemistry LiFEPO4). They contain no poisonous lead, no dangerous acid, and do not create explosive gases during charge, as traditional Lead-Acid batteries do. Compared to traditional batteries, Shorai lithium batteries are extremely light, have much lower self-discharge rate, do not sulfate, and are environmentally friendly. Can I use Lead-Acid battery chargers or charger/tenders? Yes. HOWEVER, you may NOT use a charger/tender if it has an automatic desulfation mode, which cannot be turned off. We have confirmed with Deltran, makers of the Battery Tender brand, that their products do NOT have a desulfation mode, and are therefore OK for use with Shorai batteries. Can Shorai LFX be mounted in any position? Yes. There are no liquids in these batteries. Remember to Install the Split Bar! To meet shipping regulations, this Shorai battery is disconnected and inactive to allow it to be legally shipped via ground and air services. Thankfully, the procedure to 'activate' the battery is extremely simple, but can be easy to overlook. The hardware you'll need is included in your box: A "series" bar about 1 7/16" in length, two M6 bolts and washers, four screws and a plastic cover. These pieces are bagged together in your box. 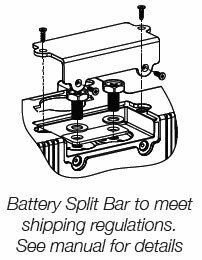 The bar needs to be installed as shown to the left and torque the bolts to 75kg/cm (7.3nm, 68 inch/lb) before your battery can be used. Down to about 20° Fahrenheit (-7°C) most users find that they can start normally on first crank. If your headlight comes on at key-ON, it is good for the batteries to flow some current before cranking in cold weather. The suggested headlight-on time before cranking depends on the temperature. If starting at 40°F/5°C, 30 seconds will help wake the battery and increase cranking performance. If at 0°F/-17°C, leave the lights on for 4~5 minutes before cranking. The result will be a better first crank, and longer battery life. If the engine fails to start on first crank, that first crank has warmed the battery, and the second attempt will be much stronger. Other accessories that can be turned on before cranking can also be used for this purpose, such as heated gear, radio, etc... Insuring that the battery is fully charged after storage also improves first-start performance in cold weather. Battery Mart's purchasing department constantly works with suppliers to offer our customers the web's best prices. But we cannot guarantee our negotiated rock bottom prices on Shorai LFX24L3-BS12 Lithium-Iron Battery will remain this low after April 23, 2019. Buy today for $237.95 and save ($237.95) (-inf%).